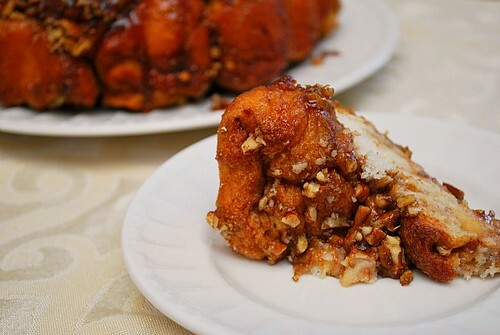 I've been meaning to make Monkey Bread for quite some time but never gotten around to it. Well, I finally had a chance but rather than making a typical recipe, I wanted to jazz it up somehow. 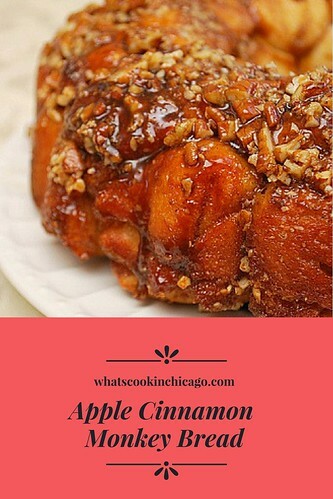 Taking inspiration from Paula Deen, I adapted her recipe for 'Gorilla Bread' to make my Apple Cinnamon Monkey Bread. In Paula's recipe, she uses cream cheese stuffed in biscuit dough and added walnuts for texture. Instead of cream cheese, I chopped up some fresh apples and filled the biscuit dough with it. You could use walnuts in this recipe but I had pecans on hand so used those instead. The buttery brown sugar sauce tied everything so well along with the cinnamon sugar sprinkled throughout. The best part of this recipe is that you can prepare it in advance, cover and chill. When you're ready to bake, just let it come to room temp and bake. I plan on making this again during the holidays since it's so easy and delicious too! Spray a bundt pan with nonstick cooking spray. Mix the granulated sugar and cinnamon, set aside. In a small bowl combine the melted butter and brown sugar, stirring well; set aside. Press the biscuits out and flatten with your fingers; dredge each side of the flattened biscuit in the cinnamon sugar. Place a teaspoon of chopped apples in the center of each biscuit, wrapping and sealing the dough around the apples; set aside. Repeat with all the remaining biscuits. Bake for 30 minutes. Remove from the oven and cool for 5 minutes. Place a plate on top and invert. 1 biscuit per "filling" amount? Hi Sarah, I'm not sure I understand your comment. Could you clarify your question? This looks fantastic! I am having company over and this looks like a great recipe thanks for the ideas! 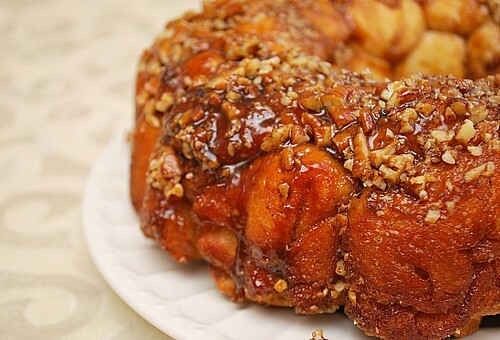 what a gorgeous, gorgeous job you did on this yummy-licious Monkey Bread! I can't wait to make it myself!